Apple has revealed its long-teased new Mac Pro at WWDC 2013, giving the desktop computer its biggest overhaul since 2010. The new cylinder-shaped Mac Pro is just a fraction of the size of the previous Mac Pro, powered by an Intel Xeon E5 processor capable of supporting up to a 12-core configuration. Apple is also using 1,866MHz DDR3 RAM. The new Pro uses Flash storage that reads at 1.25 GPBs. Apple claims that it's 10 times faster than the old Mac Pro. This will also be the first Mac to come standard with dual AMD FirePro GPUs, which can support up to three 4K displays at once. Meanwhile external expansion is all done via 20 GBps Thunderbolt 2, which is backwards compatible. The new powerhouse provides gigabit ethernet, USB 3.0 and HDMI Out. 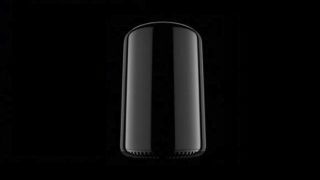 The new Mac Pro will be landing later this year, though Apple hasn't yet said how much you'll be coughing up for it.